Here's a stunning picture of humans stamping our footprint onto the landscape. 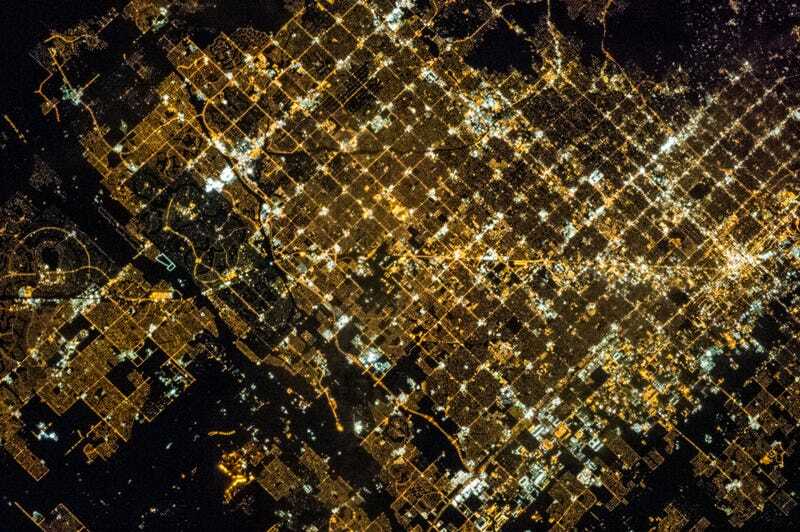 Taken by a member of the Expedition 35 mission to the ISS in 2013, this photo of the Phoenix, Arizona area is like a fractal — the closer you look, the more squares of light you see. There's a ton of great information in this photo: Phoenix itself is at the right, where the most clustering occurs, and the urban sprawl spreads from there to Glendale in the center and the less-lit Peoria at the left. There's also a bright-line cutting through the north-south/east-west grid plan. It's Grand Avenue, which runs northwest-southeast, turning some of these squares into triangles.